Have I mentioned that I adore salmon???!!! In an effort to find new ways of serving it I made a buerre blanc to go with it this time. 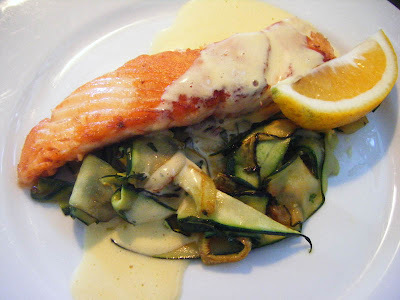 I have made a similar recipe before and it was served on a bed of minted pea puree - it was delicious, but this time I wanted to go for a lower carb version so served the salmon on a some minted, sauteed zucchini ribbons. It worked just as well and I was more than happy with this variation. The last time I made beurre blanc it was just wine, white wine vinegar and butter, and although it worked out fine, I liked the look of Al Brown's recipe where the vinegar and wine is infused with flavour first and the addition of cream. This is one of those sauces, like hollandaise, that you do have to take care with, but the effort is so met with the most gorgeous result. 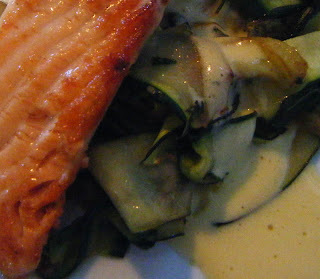 As much as salmon is a quite rich and oily fish, it is just fabulous swathed in this stuff- pure luxury on a plate. Place the wine and vinegar in a saucepan. Rough chop the shallot and add to the liquid with the peppercorns and bay leaf. Place on medium heat and reduce the wine and vinegar by three-quarters. Next add the cream and reduce by half. Cool slightly then return to very low heat. Whisk in the butter piece by piece until fully incorporated and silky smooth in appearance. Strain the sauce through a fine sieve and discard the solids. Taste the beurre blanc sauce and season with salt and pepper, and a squeeze of lemon juice if required. The beurre blanc will keep in this form for a couple of hours if kept covered in a warm place. Once it is cold it can't be reheated as it will split. A whole year has passed!